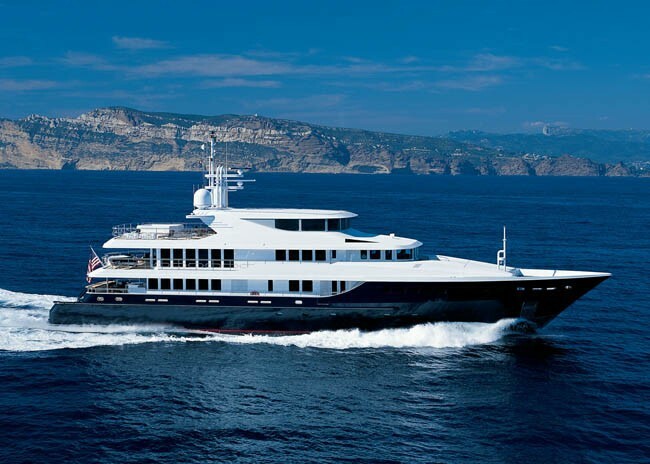 Motor yacht FOCUS is a 46 meter luxury charter yacht launched by North American Yachts and Shipbuilders in 2002 with Naval Architecture by Sergio Cutolo and interior design by Ralph Lauren. 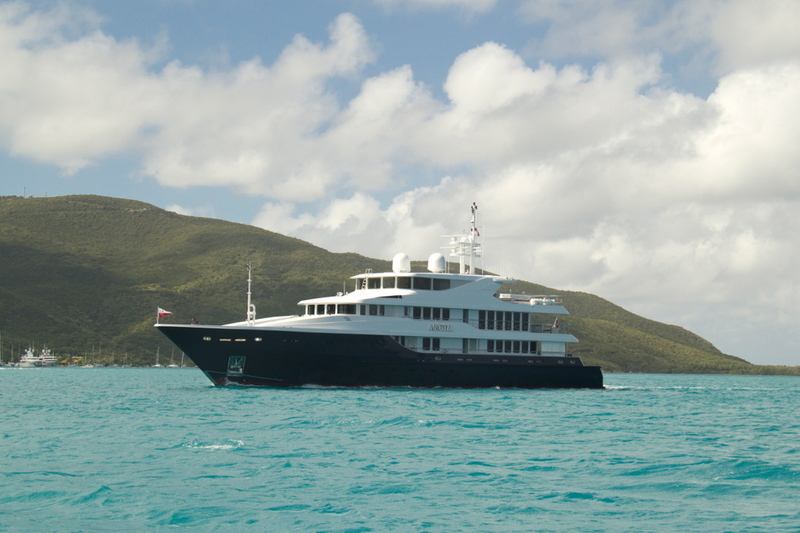 She offers luxury accommodation for up to 10 yacht charter guests in 5 cabins and is available in the Caribbean and New England. 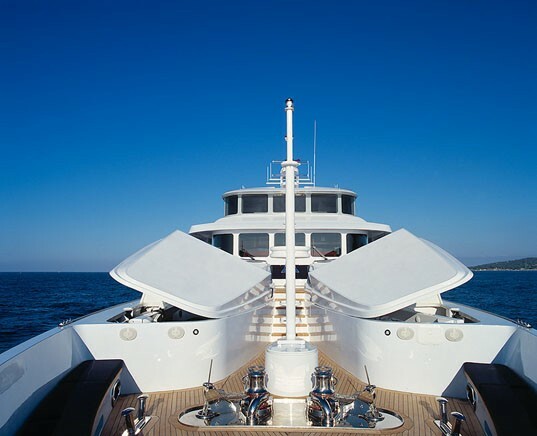 Featuring a traditional wood Ralph Lauren interior, this luxury motor yacht also offers a large lift, individually controlled air conditioning, stabilizers at anchor and internet in all staterooms and throughout the yacht. 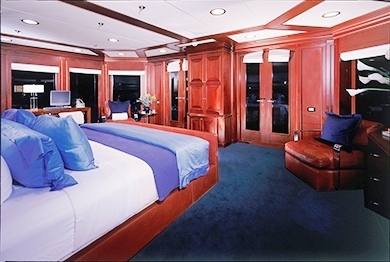 FOCUS (ex ARGYLL) boasts an impressive master suite on the main upper deck. It has a walk around king sized bed and entertainment center with TV/DVD/individual satellite receiver worldwide as well as an office desk. The en-suite facilities feature “HIS” bathroom with single sink, stall shower and head, and “HERS” bathroom with a single sink, stall shower, bidet and head - all wheel chair accessible. The master suite also features a private aft deck for al fresco dining with hi-lo table, and full wet bar. Mesh shades maximize the privacy on both sides. 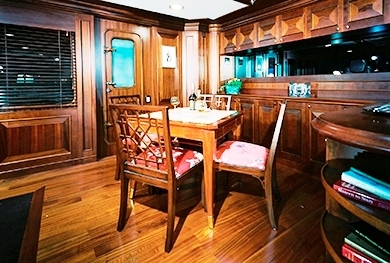 Features a side foyer, galley with bar stool seating, walk around decks and access to a private formal dining room for 10 guests. 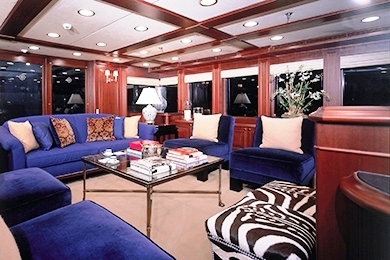 The yacht’s main salon in decorated in all in mahogany wood and offers a bar, games table, entertainment center with an individual satellite receiver. The aft deck is completely covered and has mesh shades to maximise sun protection. 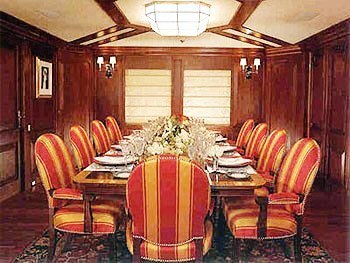 There is al fresco dining for 10 charter guests with a full wet bar and walk around Portuguese decks to a cushioned seating area on her bow. There is also access to a swimming platform with rails as well as electronic ramp access for a wheelchair. 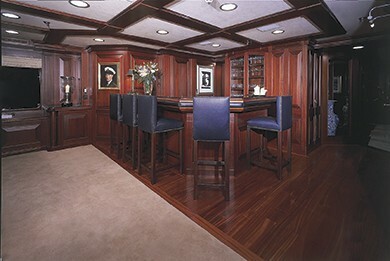 There is a library aft of Pilothouse with 62” Flat screen a decorative fireplace. A sliding mahogany partition gives option of creating privacy in library or opens onto pilothouse. Also there is an elevator for wheelchair accessible. 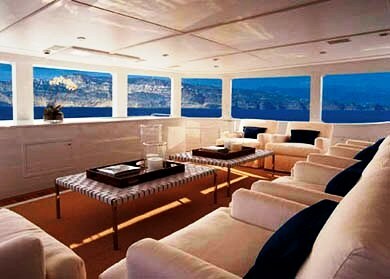 The yacht has a sky lounge which is completely enclosed and boasts a panoramic view and full entertainment center. There is also a treadmill and light weights for exercise and a wet bar. 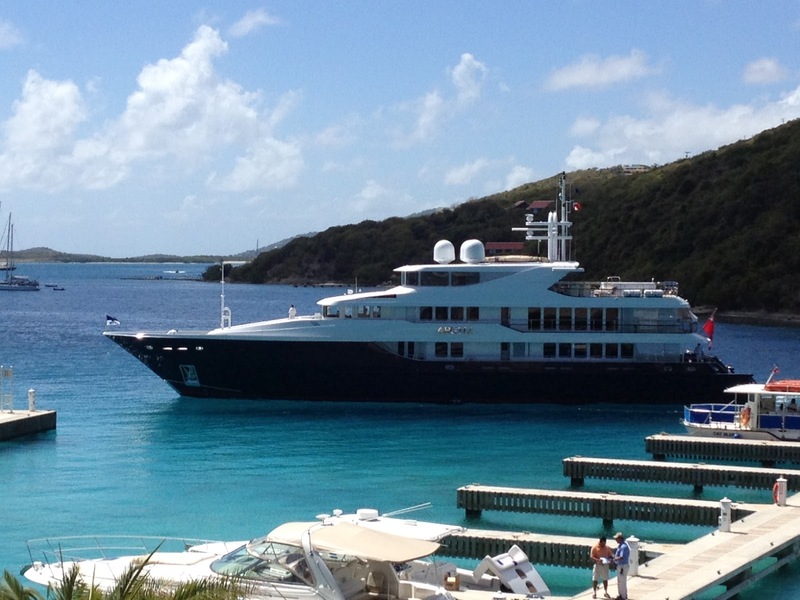 She has a sunny and open sundeck with a Spa Pool Pool and deck chairs, outside shower, wet bar and ice-maker. 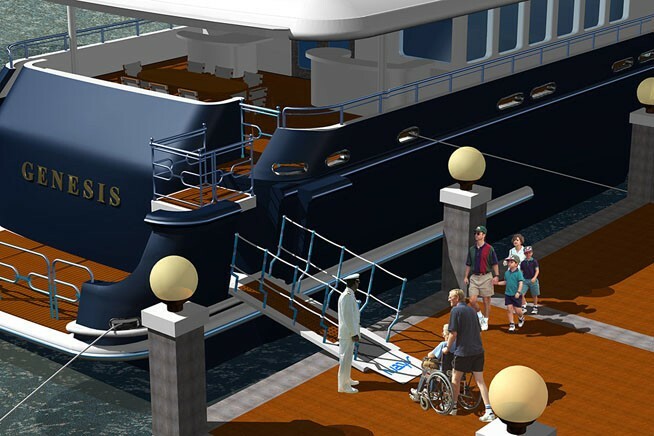 All staterooms and decks are accessible by wheelchair and elevator. 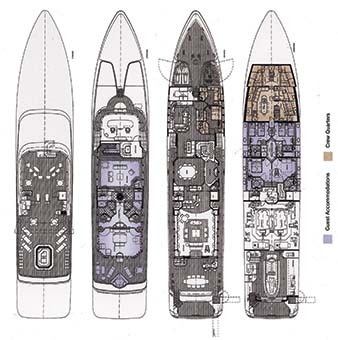 Crew has private access and companionway to all decks. Master: Upper Deck, Aft: Walk-around King Bed, state-of-the-art entertainment center with TV/DVD/individual satellite receiver worldwide; desk, and ample closet space. 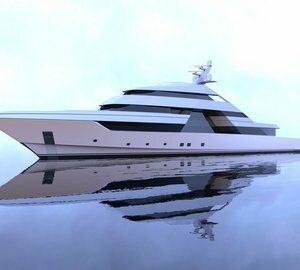 En-suite facilities feature "HIS" to port with single sink, stall shower and head - all wheelchair accessible, and "HERS" to starboard with single sink, stall shower, bidet and head. Private aft deck for al fresco dining with hi-lo table, and full wet bar. Mesh shades maximize privacy on port and starboard sides. 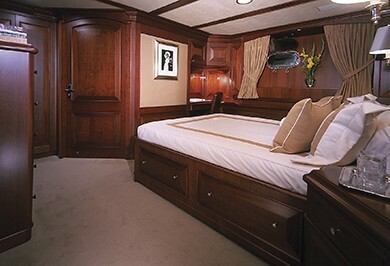 VIP 1: Aft to Starboard: Walk-around Queen bed, with en-suite facilities featuring shower. Entertainment center with TV/DVD/individual satellite receiver. Direct access to elevator. 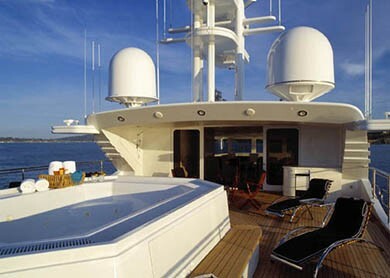 VIP 2: Aft to port: Walk-around Queen bed, with en-suite facilities featuring bath tub with shower overhead. Entertainment center with TV/DVD/individual satellite receiver. 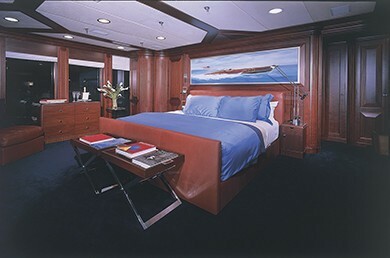 Port Twin Stateroom: Twin beds, with en-suite facilities featuring shower. Entertainment center with TV/DVD/individual satellite receiver. 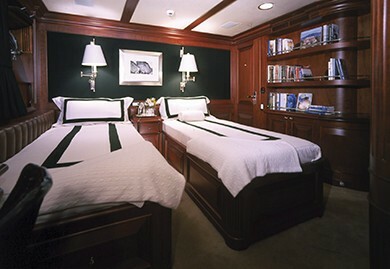 Starboard Twin Stateroom: Twin beds, with en-suite facilities featuring bath tub with shower overhead. Entertainment center with TV/DVD/individual satellite receiver. 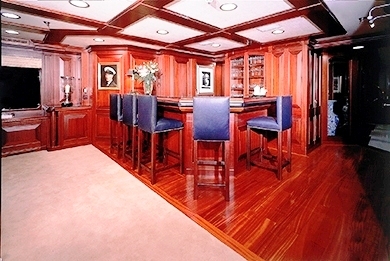 Foyer, Galley with bar stool seating, walk-around decks, access to private formal dining room for 10 guests. Main Salon all in mahogany with bar, games table, entertainment center with TV/DVD/ individual satellite receiver. 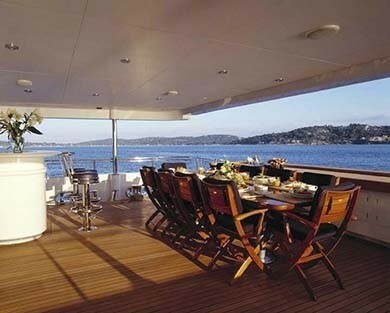 Aft deck: completely covered plus mesh shades to port and starboard maximize shade. 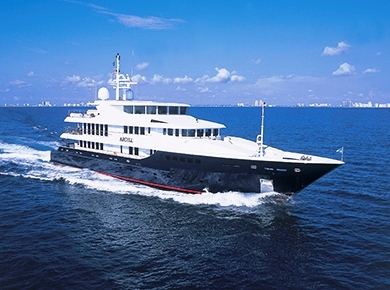 Al fresco dining for 10 with full wet bar; walk-around decks with cushioned seating on bow. Access to swim platform with rails. Electronic Ramp Access, wheelchair accessible. 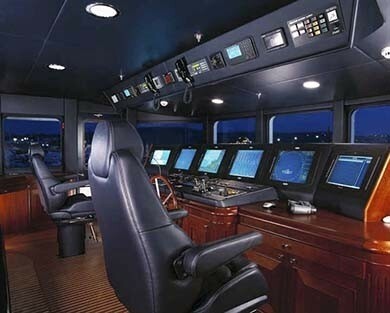 Pilothouse with Portuguese deck, cushioned seating outside in front of Pilothouse. 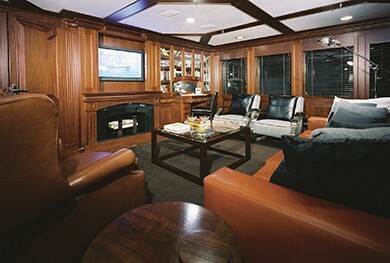 Library aft of Pilothouse with 62" Flat screen TV/DVD and individual satellite receiver; decorative fireplace. 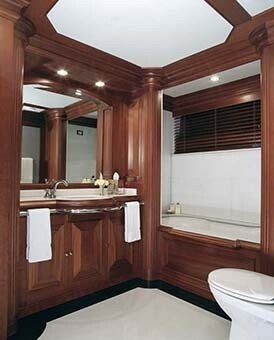 Sliding mahogany partition gives option of creating privacy in library or opens onto pilothouse. Skylounge completely enclosed with panoramic view, full entertainment center with TV/DVD/individual satellite receiver; Treadmill with light weights. 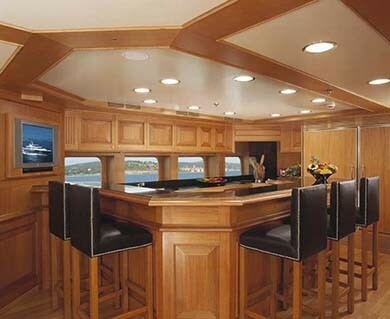 Wet Bar. Sun Deck: Sunny and open Jacuzzi Deck with deck chairs and oversized Jacuzzi, outside shower, wet bar with ice-maker. 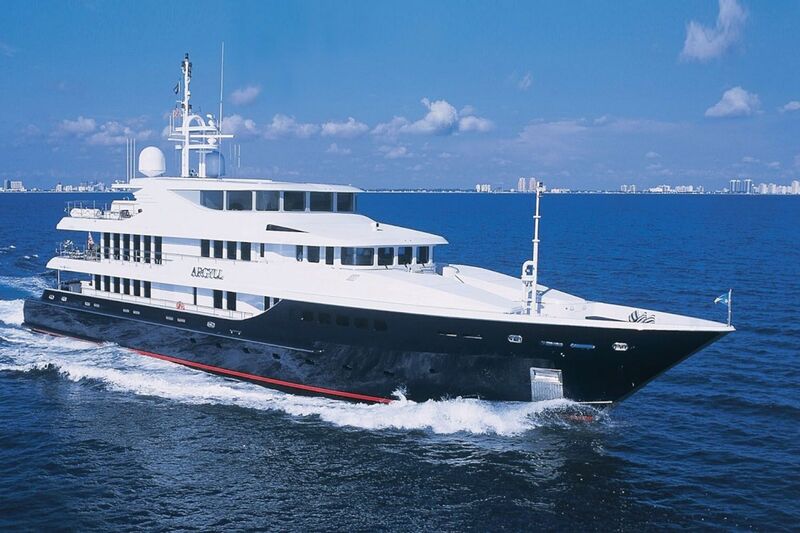 Yacht FOCUS Guest Accommodation 5 Cabins accommodate up to 10 charter guests. 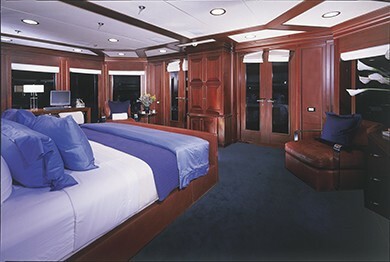 All staterooms and decks are accessible by wheelchair and elevator. Crew has private access and companionway to all decks. Tenders & Toys 24’ Nautica Cat w/240 hp with custom ramp into the water, wheelchair accessible. 9’ Zodiac w/83hp 2 x Laser Sailboats Adult Water ski’s Various towable inflatables Water balloon cannon Wakeboard 2 x kayaks (1 double, 1 single) Snorkeling gear Dive compressor Light Fishing Gear Deck Spa Pool BBQ on Flybridge 2 x Beach BBQ’s Treadmill and light weights All Decks are wheelchair accessible Elevator PLEASE NOTE: THERE ARE NO WAVERUNNERS. 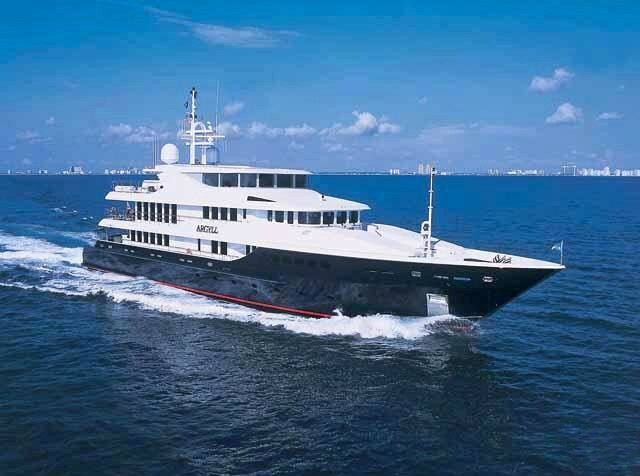 Audio Visual Equipment and Deck Facilities Satellite TV with individual satellite receivers in the Caribbean, Bahamas and USA Surround Sound TV, DVD, CD A/V library Voltage: 110V throughout vessel. Several 220V ports Communications Satellite Phone Satellite Fax Cell phone Internet Access in all staterooms and main areas Computer, Printer, Scanner, Copier.